Technology can create opportunities for students to move beyond engagement in content, where the technology may simply be replacing a traditional method of instruction, but it is not actually doing anything different than the traditional method was doing. We call this the "value-added" aspect of technology. 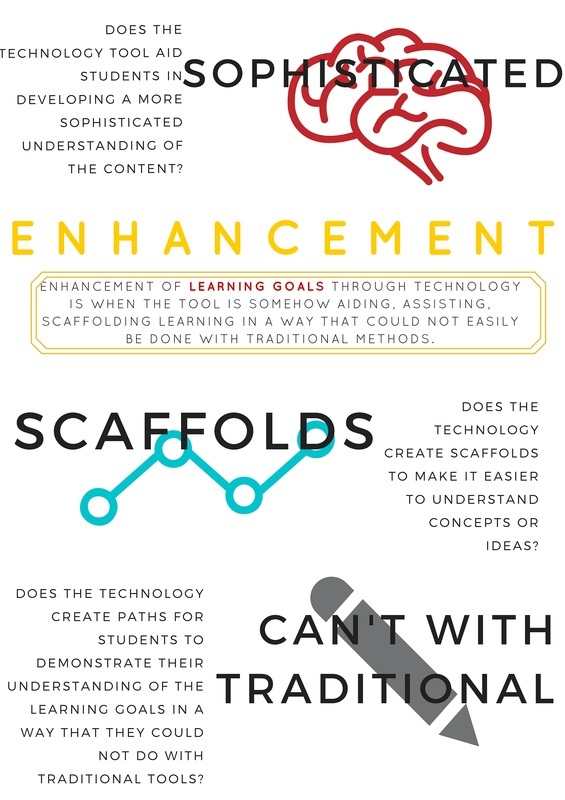 Value-added enhancement of learning through technology is when the tool is somehow aiding, assisting, scaffolding learning in a way that could not easily be done with traditional methods. This is the level where learning can become personalized and more relatable to the learner. This is when technology is really starting to change how learning occurs to make it more meaningful to the learner. Below are three questions that should be asked when measuring for enhancement of learning through technology tools. *Click here to see examples of instructional strategies that can be employed to help elicit enhancement when using the digital tool. The research below highlights the research that informs the Triple E component for enhancement. ​"Drill and practice" software has not been successful in showing positive achievements for student learning outcomes (Wenglinsky, 1998). Digital technology use for creating and exploring rather than Drill and Practice, have been found to positively effect student achievement while drill and practice has had negative effects on student achievement scores (National Association of Educational Progress, NAEP via Wenglinsky, 2006). Supporting or scaffolding technology that creates opportunities for children deepen their learning through social use (e.g., Hirsh-Pasek et al., 2015; Guernsey,2012; Takeuchi & Stevens, 2011). Value-added strategies such as promoting student self-reflection, self-assessment, and self-explanation through technology can enhance learning outcomes (Means et al. 2009). Studies are finding that the quality of work done with computers is much more important to determining student achievement than the quantity of time spent with devices (Wenglinsky, 2006). OECD Report found that of 70 countries, the top performing countries on the PISA exam (math and literacy), were not the countries that had students using technology the most often in their learning. In math, the top performances on the paper-based math exams were achieved by the students who had the very lowest use of computers in school learning (OECD, 2015). Does the technology tool aid students in developing or demonstrating a more sophisticated understanding of the content? (creates opportunities for creation/production over consumption) By students using technology to research their road trip (using authentic websites to reserve hotels, pay for meals, gas...etc), they are able to assess their understanding of rates, proportions, percents in mathematics with authentic data that connects to the real world (rather than a worksheet). They are using their higher order thinking cognitive skills of analysis, creativity and evaluation.